ASHEVILLE, N.C. — Washington may not always understand or appreciate the House Freedom Caucus, but its constituents generally do. 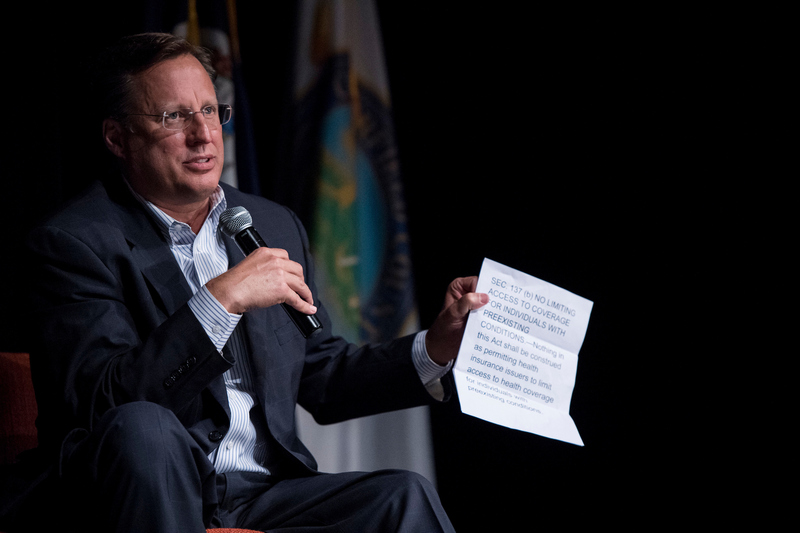 At events in the districts of three caucus members last week — Mark Meadows in North Carolina, and Dave Brat and Morgan Griffith in Virginia — a variety of constituents interviewed had not only heard of the hard-line conservative group but showed a good grasp of its mission: to provide a voice for people outside the Beltway who lack backing among Washington’s special interests. “It keeps balances and checks on everything,” said Jeff Branch, a Republican from Meadows’s district. While he laments the divide between establishment Republicans and more conservative, tea party-types — “I hate to see the Republican Party not on the same page” — Branch said Meadows and the Freedom Caucus he chairs are simply pursuing what they think is right. “He must be gaining some power with the Freedom Caucus because he’s getting things done a lot,” said Branch, who serves on the Caldwell County Board of Commissioners. Even some of Meadows’s constituents who are Democrats acknowledge that the caucus has proved itself as a powerful force, even if they don’t agree with the policies the group is pushing. Louise White, a North Carolina Democrat from Morganton, said she was glad the Freedom Caucus helped defeat the first iteration of the GOP health care bill but said they ultimately made it worse with the version the House passed, 217-213, on May 4. “I think they’re trying to be a force that they wouldn’t otherwise have as individuals,” she said, articulating the key to the caucus’ success: its members’ ability to stick together as a bloc. That bloc has shrunk from its peak total but it still has about roughly three dozen members (the Freedom Caucus does not make its membership public), enough to prevent the 238-member House GOP conference from advancing legislation without its support. The group showed the depth of its power in the health care debate, helping prevent the advancement of the widely unpopular initial version of the Republican health care bill, known as the American Health Care Act, and providing the needed support to get the revised version through the House. That vote also showed a different side of the Freedom Caucus: They actually can get to “yes,” despite a widespread reputation as obstructionists. Meadows knows that the group’s reputation on Capitol Hill won’t change overnight but he said caucus members plan to continue working with their GOP colleagues to help advance other priorities important to leadership and the administration. The Freedom Caucus hasn’t made its reputation in Washington a priority. When the first iteration of health care bill was pulled from the floor for lack of support, the group became the scapegoat. President Donald Trump taunted the caucus on Twitter, threatening to work against Meadows and others in 2018 if they didn’t get on board. Caucus members stood strong, saying they were simply fighting for what they promised their constituents they would do. In the end, standing their ground on health care won the group an amendment that addressed one of their key asks — allowing states the flexibility to opt out of insurance regulations they find onerous. All but one caucus member voted for the bill. Back home, like-minded constituents appreciated those efforts. Bill Heipp, a Republican from Midlothian, Virginia, said Brat, his representative, and the Freedom Caucus have represented their constituents’ interests not just on health care but on a host of other issues, too. “Everything that Dave ran on, every promise he’s made, he’s kept,” Heipp said. Brat constituent Kyi Foster of Chesterfield, who identifies as an independent, said the Freedom Caucus is good for Congress in that members push back against problems the establishment has created but that they need to get up to about 60 to 65 members to become a stronger voice. Democratic constituents say that while the Freedom Caucus does have a relatively strong voice now, it’s one that does not represent them. “The Freedom Caucus is too extreme for any district,” said Democrat Kirsten O’Nell of Glen Allen, in Brat’s district. She did, however, give the caucus credit for being united. Pat Phelps, a Democrat from Morganton, North Carolina, said the caucus is an indication of how the political climate has led to extreme divisions, even within the two political parties. She and her husband John Phelps helped launched a local Indivisible group in Burke County in Meadow’s district, to fight what they view are extreme views advanced by the Trump administration and Republicans in North Carolina. “We’ve lived our lives without being this kind of involved, without feeling the tremendous need to really be involved,” she said. 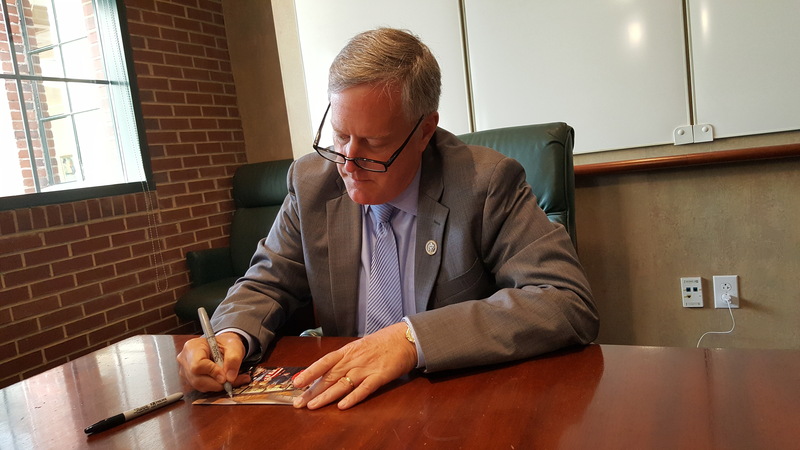 Meadows said he welcomes that kind of engagement, regardless of from which party it originates. Johnnie Carswell, a Meadows constituent and vice chairman of the Burke County Board of Commissioners, said the caucus serves a positive role in Congress, especially in its pursuits of a more deliberate legislative process. Like Branch, Carswell used the phrase “check and balance” to describe the group’s role in Congress. The Freedom Caucus was formed in part over members’ frustration with what they said were GOP leaders ignoring input from the rank and file. After the group launched in January 2015, it quickly became a thorn in the side of then-Speaker John A. Boehner. The caucus is credited with helping push Boehner to resign early from Congress. Most members of the group say Speaker Paul D. Ryan is doing a better job than Boehner but they are still not happy with the status quo. “The problem is, we don’t follow the rules. We never follow the rules. It drives me crazy,” Rep. Morgan Griffith said Wednesday in an interview from Bristol, Virginia, a town in the 9th District he represents. For example, Griffith pointed to the House’s recent passage of its health care overhaul under an expedited rule that did not allow for floor amendments. He called the rule “atrocious” and said for the first 30 seconds of the rule vote, he was locked in as “present” before switching to a “yes” vote. “I wanted to be able to tell leadership, ‘I’m not going to screw the deal up because I know you all worked really hard, but we really ought not to be doing business this way,’” he said. Indeed, the Freedom Caucus let leadership slide as they disregarded so-called regular order in pushing the health care bill through the chamber. Meadows said the flexibility they showed on health care in the interest of wanting the Republican-led government to move quickly will likely become less flexible. “Just because we have a unified government doesn’t mean regular order should go away,” he said. The Freedom Caucus will be looking for Republicans to start holding hearings on a tax code overhaul and infrastructure funding package, two of the party’s upcoming priorities. “One of the things I’m taking back from just this recess here is, it’s very important that we go back and start working on a transportation bill,” Meadows said. He said constituents want to ensure smaller, more rural towns’ infrastructure needs are included along with those of major metropolitan cities. “Let’s go ahead and have hearings and start working on the transportation side of things,” he said.